As requested by Sam Berliner III, this is a photo of the 1907 Flyer that won the 1908 New York to Paris Race in the Long Island Automotive Museum in Southampton. Courtesy of Walter McCarthy. The 1907 Thomas Flyer was purchased by Austin Clark for $3,000 in 1948. In this undated photo Austin Clark, his wife and daughter, are sitting in the Thomas Flyer with Montague Roberts, one of the winning drivers of the 1908 New York to Paris Race. 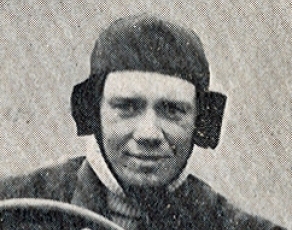 Although Roberts never participated in a Vanderbilt Cup Race, he drove Thomas cars in both the 1905 American Elimination Trial and 1906 American Elimination Trial. 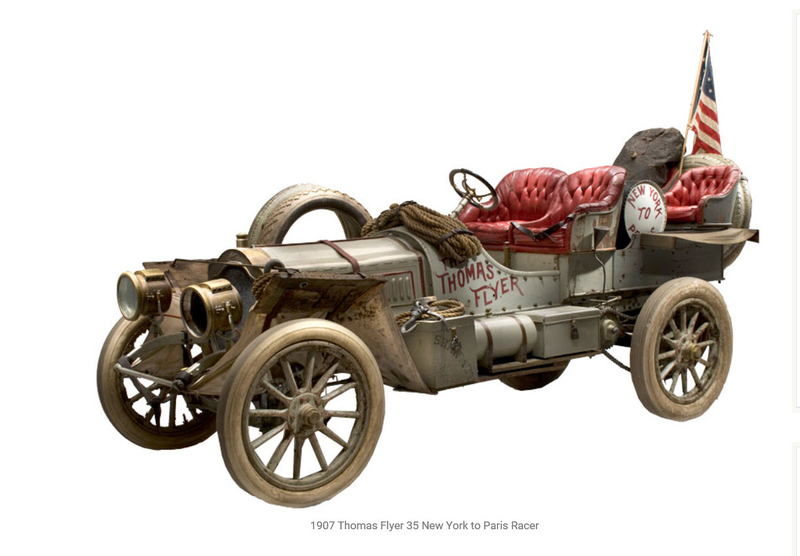 The Thomas Flyer and its winning 1908 trophy were both sold to William Harrah in the early 1960. It is currently exhibited at the National Automobile Museum in Reno, Nevada. Thank you for reminding us of this interesting part of automotive history. I always under the impression that George Schuster was the winning driver of the NY to Paris race in 1908. Schuster and Roberts split the driving for the Thomas Flyer during the 1908 Race. Hi Howard. I just finished rereading Julie Fenster’s detailed account of the 1908 “race of the century”. At the end of the book she does not mention that the Thomas was purchased by Austin Clark which I find interesting. She states that its “provenance is a little disjointed” following the sale of the car by the publisher of the “Buffalo Commercial” newspaper. The last picture that you posted is the condition of the car as I remember it at Clark’s museum, so he must have had the car restored to its appearance at the end of the race. I also had the opportunity some years ago of seeing the Protos in the Deutsches Museum in Munich. I have very fond memories of seeing the Thomas Flyer at Austin Clark’s museum on my many visits there. To me, it’s a shame that Bill Harrah had the car restored. I preferred seeing it in its original state. Austin Clark never had any restoration work done to the Thomas, he left it as he found and purchased it. Bill Harrah had the car restored in his shops in Nevada. For years George Schuster doubted that the car was the one he used in the race and it drove Austin crazy. Austin even offered to go get Schuster at his home upstate and drive him out to see the car etc to confirm but Schuster refused to do that convinced he was right. Well after Bill Harrah bought the car from Austin Schuster finally agreed to a trip ( fee vacation was attractive???) and when shown the car at Harrah’s and the repairs to the chassis that were made during the race finally said ” oh yeah it is the real car, imagine that”, This really annoyed Austin no end - for decades Schuster couldn’t bother to go see the car and when he did it was more then half way across the USA. I can not describe Austin’s words about that injustice on Schuster’s part to even go have a look. 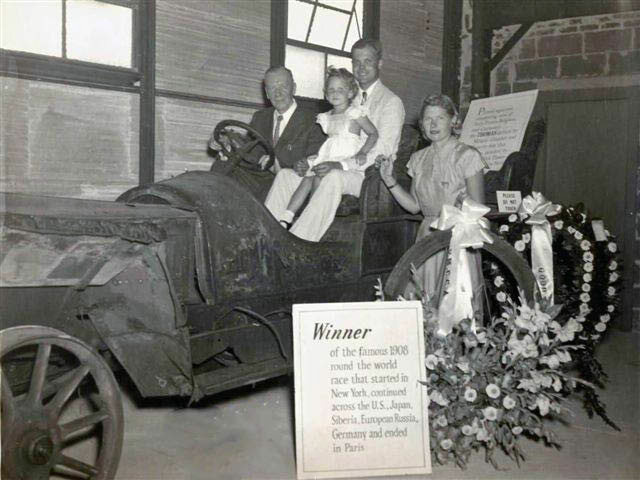 Bill Harrah never understood that either as Bill and I were friends due to his interest in Franklin automobiles. We spoke of it at the Franklin Club annual meet in central NY and at Hershey and Bill would just shake his head and not know why . Austin and Bill had great respect for each other. I still have a number of Christmas cards that I received from Bill ( and his assorted companions of the particular year) that we would exchange. Every year for over a decade we would spend the week at the Franklin meet driving around with the rest of the group there. He brought 3 or 4 cars out from Reno for that meet and until I had my own Franklin there was told - pick which one you want to drive for the week. Walt, I am impress that you’ve known two of the most prominent men in the vintage auto world. I was at Harrah’s 1977 some 3 months before he pass on, had a great opportunity to view his vast collections (had to sit down at times on some of the benches) unbelievably sight. Besides the Thomas Flyer, 2 big coach style Bugatti Royale town car among other Bugatti’s, a surviving 1923 Chevrolet Copper Air Cooled coupe, the 3 P’s, all the years made of Packard, Pierce Arrow, and Peerless, among the other gems like the Duesy, Caddies etc. Think Howard’s Alco might have been there? All gone, scattered about. Mark, I got into collecting “old cars” in 1963 when I was in my early teens ( at that time an old car was one built prior to WWII) My passionate interest in auto history was always there too - I wanted to know who designed and built them and where. Friends had Franklins so I got interested in them as well - as a teenager I was amazed a car had been built in NY for decades . Bill Harrah loved Franklins and would always attend the Franklin club meet in/near Syracuse NY where they were made . He really knew his cars - didn’t just own them! The fellows that ran his collection became friends and for years would seek me out when they arrived with the cars days before Bill did . The driver of their tractor trailer to haul cars was Yarrow Slovack and Clay Thomas, Paul Larios was head of the collection and would arrive a day before Bill Harrah flew in to rent a modern car to get the boss at the airport. All became friends and when they weren’t around I was the one trusted to move the Franklins they hauled in ( usually 3 or 4) for the week long event. Bill brought his two adopted sons at least two years in a row when they were about 8 - 10 years old. They liked to climb the trees that were on the campus of the college in Cazenovia NY where the Franklin meet was held. During the year if a Franklin at the Harrah shop was being restored, Mike Moore their head of research would call me if they were focused on a detail that their library didn’t have the exact information on to see what I had and I usually could answer that. As of 2019 I have been collecting pre war period magazines, literature, period photographs etc for 55 years. Other kids were buying Beatles records in the 1960s and I liked Pierce Arrow, Locomobile etc. sales literature and brass car mascots/hood ornaments better so saved up and bought those instead. Austin Clark only lived about 15 miles north of me so due to my collecting of period material we got to be friends too, and I was his part time librarian at his library at his house in the early 1970s when I was going to college for graduate school. All kinds of stories and great memories of my friendships with both Bill and Austin who were collectors in the true sense of the word, not investors like a lot of enthusiasts who claim they are collectors today. Funny, I took Tucker 1044 out on the road yesterday. Many thumbs ups! !